The Battery Warehouse Ltd was formed in April 2010 and has a distribution centre and retail shop based at two locations in Grimsby, North East Lincolnshire and Hull, East Yorkshire. Our company directors have over 30 years experience in the battery industry and because of our contacts built up over the years we have established a good quality product portfolio and offer a exceptional service. East Yorkshire and Lincolnshire does not have a battery specialist which holds such a variety of different products covering many different brands and sizes and then be able to supply that product on the same day. 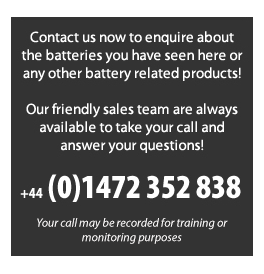 The Battery Warehouse can offer our customers a wide variety of batteries which on many occasions can be difficult to source quickly and competitively. Whether your requirement is a battery for a watch or a combine harvester the Battery Warehouse can supply you a quality branded battery at a very competitive price. We offer over 30 years of experience in the industry so our technical expertise is vast giving you the knowledge you will receive the correct product type for your requirements. We offer a free local delivery service for customers within the Lincolnshire and East Yorkshire region. We supply nationwide with a next day delivery service. We offer a free battery test and if required have charging facilities to check the quality of your current battery. We offer quality brand names at very competitive prices. We offer a larger variety of battery types than any other local battery specialist. This ranges from watch, key fob, remote control to automotive, leisure, mobility to the commercial and agricultural types. We offer a free of charge disposal of old batteries which is compliant with the Environment Agency regulations. For any Battery large or small the Battery Warehouse stocks them all. The Battery Warehouse has a set of strategic guideposts for operating our businesses to achieve long-term success. As we grow, so will our people. We foster a culture that promotes excellent performance, teamwork, inclusion, leadership and growth. Our employee and leader diversity will mirror our current market levels. We believe there is always a better way. We encourage change and seek the opportunities it brings.